JustNick – tagged "Digital Cut Files"
Marcia here today. One of the things I love about Christmas most now that my kids are adults are their homecomings around the holidays... and not just Christmas. Homecomings can occur any time during the year and I think they are always joyous occasions! So I thought I would scrap one of those homecomings using the Joyful title to show you it can be used all year around. I cut the Joyful title out twice to make my title more interesting. I trimmed out the pieces I wanted by hand and layered them in some cases using pop dots to add dimension. I also used pieces of the Star Background 2. I hate throwing scraps of paper away. 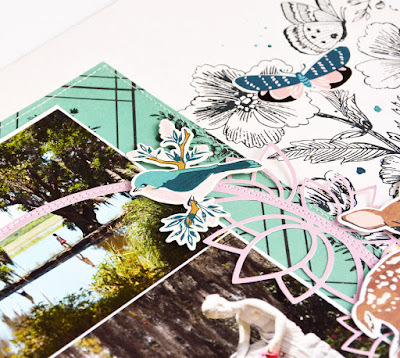 When you cut out this digital cut file, you could use both the positive and the negative pieces! Because the Joyful title had stars, I dug out these stars I had cut previously. The color was a good match with the pattern paper. You can't go wrong with stars ... they are perfect for guy layouts when you don't want to use flowers. Thanks so much for stopping by. I hope you capture some joyous moments this holiday season! Happy Holidays! Do you make holiday cards to send at this time of the year? Marcia here today. I try really hard to make cards and get them all mailed out. Some years I do better than others. I can't seem to force myself to make any though until after Thanksgiving. I am in full Christmas cardmaking mode now though, lol. I love using digital cut files on my cards just like I do my layouts. On my first card I added a pretty Layered Poinsettia along with some Stems 2. I love the dimension the layered poinsettia adds. For my second card I used the Holly Ring digital cut file to frame my sentiment. Hello friends, today I have a Fall themed layout using this magnificent Mandalla Leaf! I re sized the leaf to fit with my layout design and cut it in an ombre paper which creates a light/shade effect, as I chose not to paper back the cut file. You could of course paper back the leaf also. I have used Photo Play Paper Gypsy Rose collection, which has perfect fall colours. It also matched perfectly with my photo of my daughter at the beach on a winters day. My white card stock has been cut down to 10x10 inches as I wanted to add several paper borders. I then used some wet glue and added small dots of glue and attached to my white card stock, this allowed my leaf to lift (as not totally glued all over the back) and give the illusion of it floating. I then foam taped my photo, 'beautiful' title, butterflies and floral blooms. I have also tucked embellishments under my layers, this adds variation of heights to your layout, which when you have a large cut file ensures all elements stand out visually. I chose to add two border papers, light and dark which again ensured my leaf really popped. I added accents stickers and a banner feature to my layered page border which added visual interest to an otherwise flat page border. There are lots of embellishments on this layout but as I have created clusters it does not look too busy. The Mandalla Leaf really is the star of this layout, the detail of this cut file is just beautiful. Thank you for stopping by today and hope you have a wonderful week with a little time to create! Hello Rachel here! 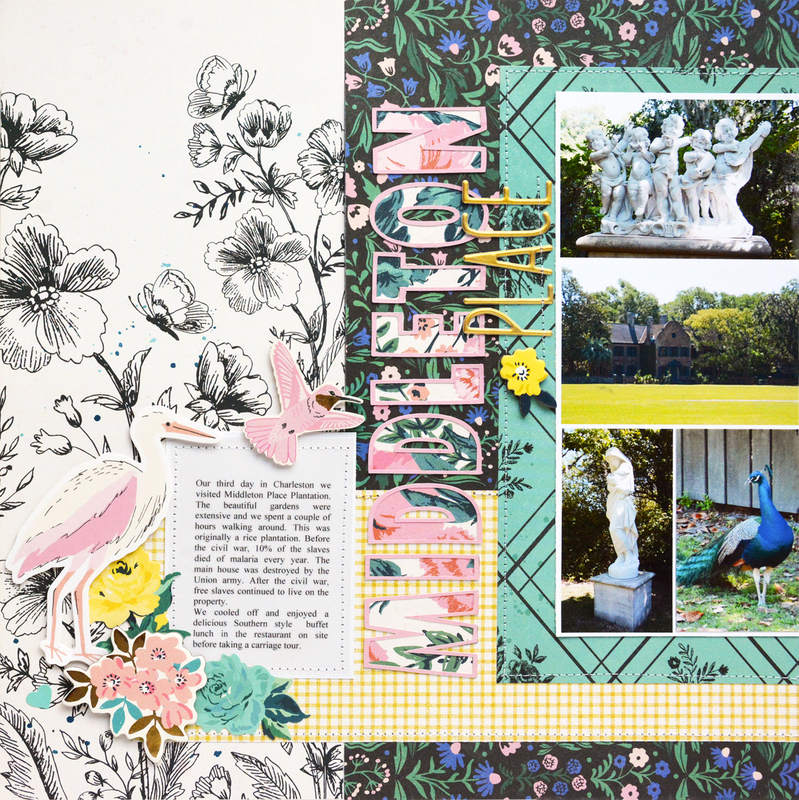 OK I admit I am butterfly addicted and LOVE to add them to my layouts where ever I can! So this layout is all about butterflies and isn't this cut file just gorgeous. I firstly cut it in white cardstock but instead of using the actual butterflies I used the negative left in the white cardstock. I backed the 12x12 white cardstock with a black pinstripe paper so they really stood out. 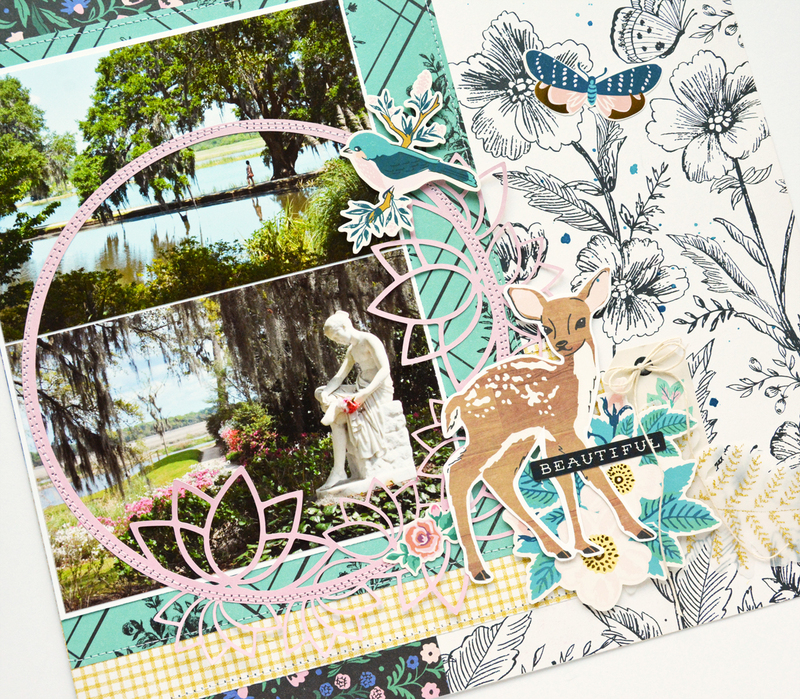 I have used Fancy Pants Designs The Bright Side Collection. I then cut another one from a floral paper piece and chose which ones I wanted to add over the black ones. I fussy cut the ones I wanted (adding some machine stitching to each before attaching) and attached with foam tape so it gave the appearance of them fluttering their wings. I added my photo using a doodle frame from the Bright Side collection, adding the chipboard title 'It's a Beautiful Day' finished off with some floral blooms. This layout is of my mother and daughter, my mother and daughter drink exclusively tea (I am a coffee drinker) and hence why I added the two tea cups over the machine stitched scallop borders. I cut down my 12x12 white cardstock and added a floral border for more contrast. I finished my layout off with some tiny hearts added to the back butterfly wings and a light splatter of black color shine. Thank you for stopping by today and have a wonderful and creative week. Today I have a 8.5x11 inch layout with two cut files from the store. I resized the Hearts a Flutter background cut file so it would fit my 8.5x11 inch layout. I cut it in white card stock and then added some blue paper behind several of the hearts for definition and to tie my color scheme together. I have used Fancy Pants Design The Bright Side collection which os just gorgeous! I adore this photo of my son with his grandparents and wanted my layout to be soft and pretty. My title 'thankful' is about how lucky he is to have such wonderful and loving grandparents. When I attached my title, I slightly curved it and then glued down into place. I ensured my 'thankful' title was a contrast color so it did not get lost against the Hearts a Flutter background. I added a word sentiment from the die cut pack to finish my title off. I paper layered my photo mat and attached my photo with foam tape. I added the floral bloom die cut and again with foam tape. 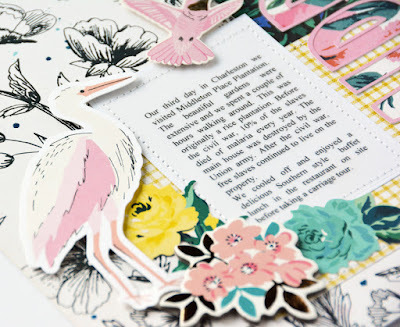 I finished off adding a heart chipboard piece to the top of my photo, and a gorgeous die cut bird. I created another element in the bottom corner of my layout, adding another die cut bird over a floral wreath, again I added both with foam tape for a 3D effect. And as always I added a light splatter of black color shine. Thank you for stopping by today and I hope I have inspired you in some way. See you again soon! Marcia here today. One of my favorite destinations for a summer road trip is Grand Marais Minnesota on the shores of Lake Superior. The lake is so big it almost like seeing the ocean. It was a foggy rainy day when we were there, but that just added to it's mystic. When scrapping this favorite photo from the day, I wanted a way to convey the greatness of all that water ... Lake Superior is after all the largest of the Great Lakes. I think the Wave Background digital cut file does it justice! I still wanted a skyline on my layout so that I could also convey what a cloudy day it was, so I erased the top portion of the background. That left room for me to include some clouds from the Sunny Days digital cut file. I carefully added some machine stitching to emphasize the waves on the background. I love the effect. Thank you so much for stopping by. Have a great rest of the week. 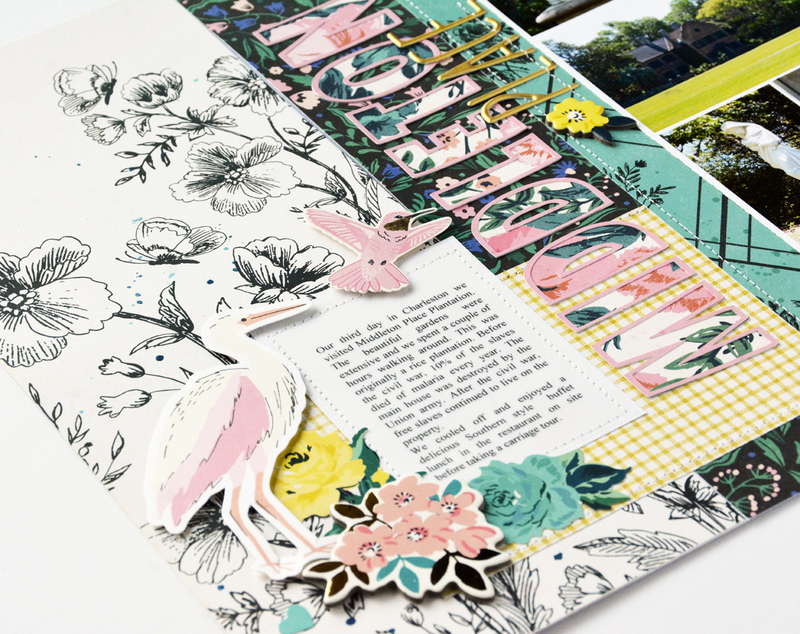 It's Jen today with my final project as a member of the design team, which is a layout using the Age is Just a Number cut file with Lawn Fawn papers. I began this project by creating the background paper, which was done by splattering watercolor paints on white cardstock. Once the paints had dried, I trimmed the paper 1/4 inch on each side and backed it with patterned paper. Next, I created the title by cutting the "fourteen" with white cardstock and then shadowing that with another patterned paper. The embellishments are a hodge podge of goodies collected over the past couple of years. I tried to keep them to a minimum because I really love the bold title and wanted it (and the photo) to be the focus of the layout. The fringe was added to the bottom by chance after seeing it on the floor of my craft room. LOL! The acrylic stars and sentiment are from Scrapbook Circle. Thank you so much for joining me today! It has been a wonderful year with Nicole and the other team members, and I look forward to loads of inspiration from the incoming team. Marcia here today. Do you like to try new trends? Mandalas and doily patterns are really hip right now. I wanted to show you how you can use these on a layout with dramatic results. I used the Dainty Doily digital cut file to make an eye-catching background for my title. In addition, the doily pattern duplicates the shapes and textures of the sweetgrass baskets in the foreground photo. 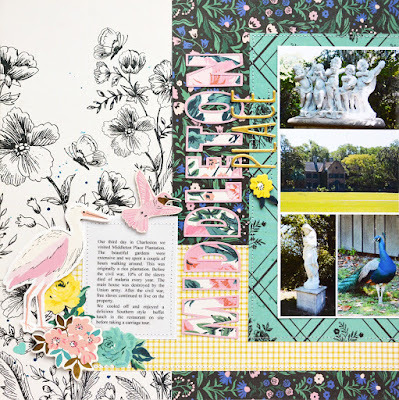 Hello JustNick friends today I have a fun layout for you using two fab cut files! I have used Rainy Days clouds and Rain Rain Go Away umbrella. I have used the fun new collection by Dear Lizzy Stay Colorful. I sized the cloud cut file so it would fill horizontally my 12x12 white base paper. I then cut another using the trace function and cutting it solid in the sea green paper. I then used a wet glue to attach the outer cut file over the sea green paper. I then did the same cutting process with one of the umbrella cut files, I again sized it to suit my layout. I fussy cut the flowers from one of the papers and placed horizontally at the bottom of my page. I attached by sewing across the flowers but close to the edge so I could tuck embellishments into the flowers. I then had fun playing with the die cuts from this collection to create a fun and whimsical scene to each side of my photo. I love light boxes and this saying on the light box was just perfect for my daughter at that time. I finished my layout off adding some butterflies, puffy stickers strawberries and hearts and 'good times ahead' sticker. 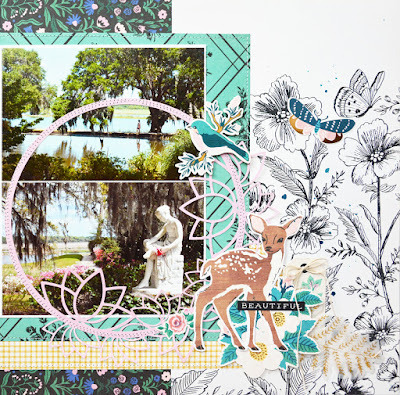 Thank you stopping by today and I hope this layout inspires you to create soon! 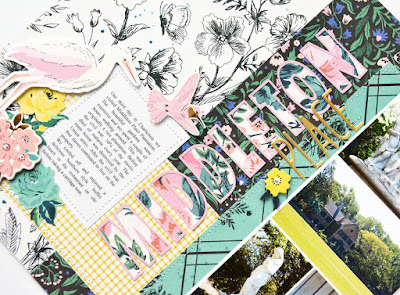 It's all about celebrations on the blog this week, so naturally I had to create a birthday-themed layout! For this project I used the Banner Essentials and Let's Party cut files with the Pink Paislee Confetti Wishes collection. I began by using the pink patterned paper and splattering gold, black, and white paint on it. While the paint was drying, I used the Let's Party file to create the clusters of balloons in various sizes. Each of the balloons was backed with patterned paper from Confetti Wishes. Additionally, I used the numbers from Banner Essentials to cut 1-5, which I welded prior to cutting. I enlarged the number three and cut it out using patterned paper to make it more prominent. Because there are so many patterns and colors on the layout, I stuck with a black and white photo so it wouldn't clash. 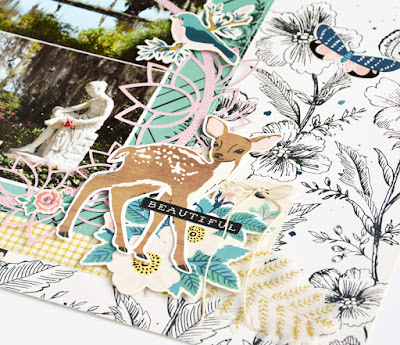 I clustered several die cuts and chipboard embellishments around the photo for added color and dimension. Last was the gold Thickers title with gold circles and hearts throughout the project. 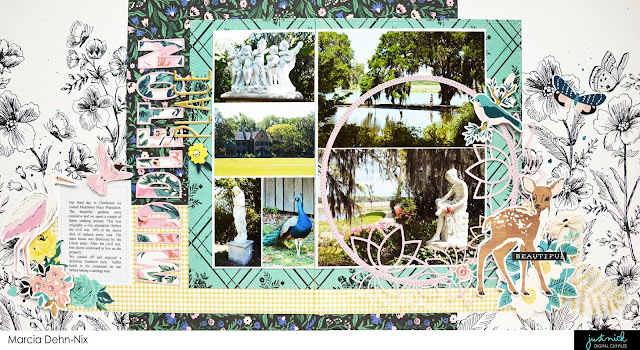 In the bottom-right corner I added Abby's initials and the date followed by a doodled border around the layout. The finished layout is bright and cheery and captures the fun we had that day. Thank you for visiting today and I hope you are inspired to create. 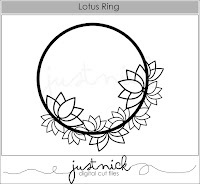 Be sure to visit the JustNick store for these and many other wonderful designs! !